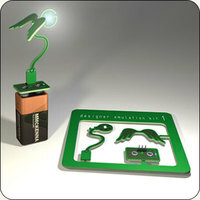 Make a lamp with a Designer Emulation Kit. (DEK's for short) are meant as the sincerest homage to some of the greatest modern designers of our time. The lamps and designers being "emulated" have a particular importance. They are represented in countless design tomes extolling the various movements, and they are held up as prime examples of "good design." We revere these objects, but they are also a bane and a challenge. How can we ever measure up to the genius of Castiglioni, or the sheer concentrated emotion of Maurer? The truth is we can't. We have to find our own voices, our own vision. Are you bilingual? Did you ever try to type in a different language using a standard keyboard? Well the Optimus keyboard is the solution to your problem. Each key is actually an OLED screen, designed to display, what each key does once an application is ran. Another great thing is the language feature. After selecting any language available in Windows, the keyboard changes the keys from English to the desired language. Aside from that, there are layouts for common appliances like Photoshop, or popular games like Quake. Rumor has it, that the keyboard is going to cost $300, this is still unknown for a fact. 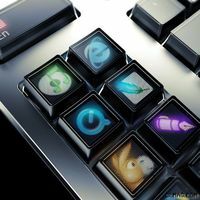 This keyboard is a very cool concept, and will definitely be something on everyone’s wish list. The OLED screens in each key are truly a revolutionary concept, and the availability of all the languages tops it all of. Optimus is good for any layouts from Cyrillic, Ancient Greek, Georgian to Arabic and so on this contributes to an infinity of: notes, numerals, special symbols, HTML codes, mathematical functions. Now if only the price was in my budget I would be first in line. The uniquely designed Imation Flash Wristband provides an easy way to transport your precious digital files, such as photos, music or videos, securely around your wrist or attached to a backpack. Providing the ultimate in portability and durability, the Imation Flash Wristband consists of a rubber molding shell and friction fit locking band, assuring you that the drive, and your valuable files, such as homework, photos and e-mails, are protected from accidental damage. The Imation Flash Wristband holds up to 256 MB of data and can be used on any computer. To use, simply “unplug” the wristband and plug the drive into the computer’s USB port. Then, “drag and drop” digital files from the computer’s desktop to the wristband or vice versa, in a matter of seconds. Starting this January, the Imation Flash Wristband will be available in “one size fits all” blue and black colors in Target stores across the U.S. for a manufacturer’s suggested retail price (MSRP) of $34.99. 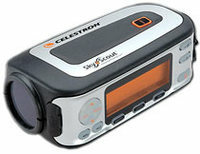 The SkyScout is a revolutionary, one of a kind, patented handheld device that instantly identifies and/or locates any celestial object visible to the naked eye, providing educational and entertaining information, both in text and audio. Point the SkyScout at any bright star and it will instantly identify the object or choose an object from the celestial database of over 6,000 objects and the SkyScout will guide you to it. It uses a combination of GPS and other positional sensors and a database of over 6,000 objects to accurately tell you what you see through its viewfinder. Includes software, USB connectivity, and SD slot expandability so that the fun is virtually endless. Doesn't appear to be any word on price just yet though, so stay tuned. UPDATE (1/4/06): Its is going to be available in the US in March for $400. The company hopes to offer it in Europe -possibly via Amazon - later in the year.